Peterborough United owners and Peterborough City Council officials sign the papers that move the football club much closer to buying the ABAX Stadium back.. Front row, left to right, cllr John Holdich, Dr Jason Neale, back, Cllr David Seaton, Stewart 'Randy' Thompson, PCC Chief Executive Gillian Beasley, Darragh MacAnthony. Photo: Joe Dent/theposh.com. Peterborough United are closing in on a deal to buy back the ABAX Stadium from Peterborough City Council. A joint announcement revealing the news at the football club’s Hall of Fame launch tonight (October 18) was greeted with great cheers from Posh supporters. Peterborough City Council leader John Holdich (left) and Posh co-owner Dr Jason Neale sign the papers which moved the ABAX Stadium close to returning under the club's control. Photo: Joe Dent/theposh.com. The two parties expect the sale of the stadium and grounds in London Road to be finalised over the next six months after signing a Memorandum of Understanding (MOU). Posh are keen to redevelop and modernise a stadium with a current capacity of 14,100. Dr Jason Neale, the Posh co-owner who led negotiations with the city council, said: “As stewards of the Posh we are building a better, bigger club. After a long negotiation terms are believed to have been agreed, but it is understood the deal will take time to complete due to covenants attached to the land. One involves the right of the Posh Supporters Trust to attempt to buy the stadium back themselves. The Trust is thought most unlikely to get involved. Peterborough City Council bought the stadium and surrounding land for £8 million from Peterborough United Holdings Limited (PUHL) in 2010, a deal which was widely welcomed as it secured Posh’s future. But it caused plenty of anxiety for Posh chairman Darragh MacAnthony who revealed the rent was set at £500,000 a year with the club responsible for repairs and improvements despite being tenants. 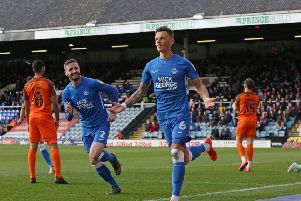 The Peterborough Telegraph has asked both Posh and the council how much the club are paying to buy back the stadium and land. The club said in a statement the purchase price was based on “fair market value”. The council has so far declined to respond. Mr MacAnthony said: “At Posh we remained focussed on three key objectives. “1 - to secure Championship football and thrive once there, 2 - to return the ground to club control and 3 - to improve and expand our facilities and our youth system. The MOU envisions investment in new and improved grassroots training facilities serving footballers from Under 4 to the senior level across Cambridgeshire, with a strong focus on Peterborough. Council leader Cllr John Holdich said: “As a lifelong Posh fan I’m pleased the London Road ground will once again be in the club’s ownership. Peterborough United is at the heart of our community, both geographically and culturally. “By making the purchase back in 2010 the city council was able to ensure the ownership of the ground remained in the city and ultimately returned to the club. “It was also able to unlock the development of the surrounding land to create the Allia Future Business Centre, 295 carbon zero homes on the Vista development and space for future affordable Medesham homes. “Our city benefits both economically and socially from the club’s continued success, bringing in over £7 million of revenue into the city each year, boosting tourism and improving the fitness, health and wellbeing of over 1,000 children from all communities per week. The proposal also calls for a major community development initiative based in Peterborough that will deepen the relationship between Posh and the community. This will focus on sports science, digital arts, software and other technologies traditionally not found in the region. A plan will be presented to the community for input within a year of the sale being completed. The arrival of new Canadian Posh co-owners, Dr Neale and Stewart ‘Randy’ Thompson, has sped up negotiations with the council.